We’ve just added a handy new feature that allows you to share confidential information about each of your Gigs via your Gigs feeds in Apple iCal, Google Calendar, XML, JSON & RSS formats. 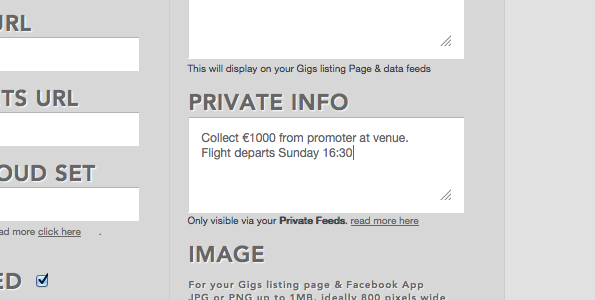 Simply add the information when editing your Gigs and then share this privately via the new Private Feed URLs. 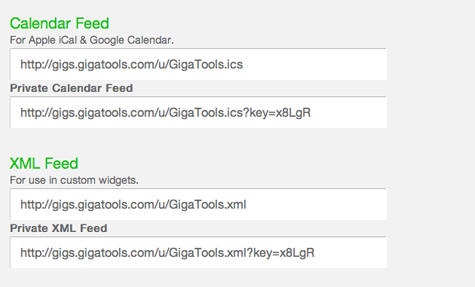 You can reset these URLs at anytime to revoke access to anyone you may have shared your feeds with. 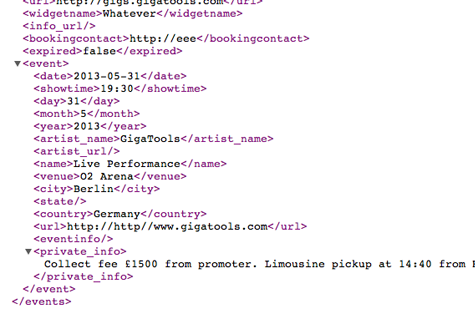 This information will only be visible via these Private Feed URLs. This entry was posted on Friday, December 27th, 2013 at 5:52 pm and is filed under Help, News. You can follow any responses to this entry through the RSS 2.0 feed. Both comments and pings are currently closed.